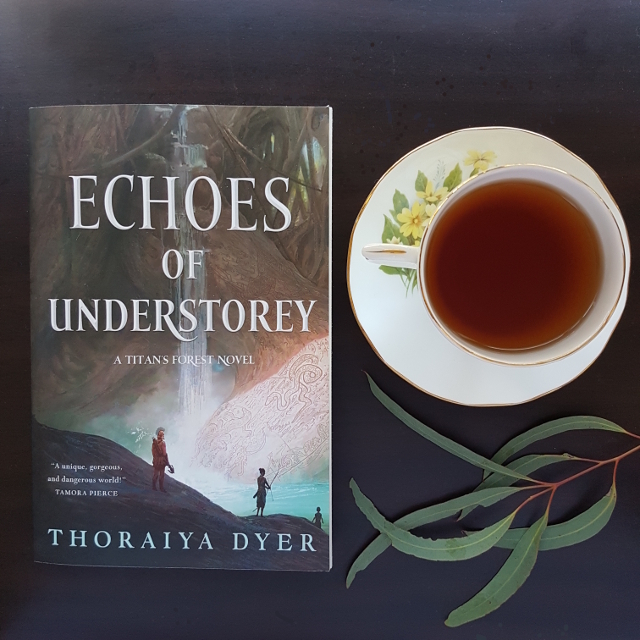 Crossroads of Canopy was one of the most thought-provoking books I read last year, so I was delighted to get my hands on a copy of the sequel, Echoes of Understorey. The new instalment skillfully adds to the worldbuilding that was a strength of the first book, opening up the way for new characters and themes. Not having paid any attention to the blurb, I was surprised to discover the main character was not the same one as in the previous book. Imeris was a minor character in the previous book, a foundling baby being looked after by three Understorian brothers who also offered refuge to our previous protagonist, Unar. Now, Imeris is a young woman and a fierce warrior. She has spent most of her life training in different styles of combat, determined to take revenge on the body-hopping witch Kirrik for killing her best friend. Imeris makes for an interesting contrast to Unar. At 21, she’s older than Unar was in Crossroads. However, where Unar had a place in the world and rejected it, Imeris is still finding her niche. As a Canopian brought up in Understorey, she doesn’t quite belong in either world. One ongoing theme throughout the book is about unification of fragments and the way it plays out for Imeris put me in mind of Binti, Nnedi Okorafor’s series of novellas. Having grown up in Understorey, and being the only woman in traditionally male-dominated spaces, makes Imeris both less privileged and more conscious of the privilege she does have. Where Unar would blindly barrel ahead, thinking she knew best, Imeris is less self-centred. She takes her duties toward others very seriously and thus becomes bound by their demands of her. While most readers will find her more likeable than Unar was, Imeris is not without her flaws. At times she resents the burdens others have placed on her, longing only to fulfil her mission–which she imagines will bring about the unification of her different identities. She also makes mistakes, sometimes fatal ones. However, these flaws are also a big part of what makes her relatable. I admit the book took me a bit for me to get into. The last book had a reasonably big cast and I floundered a bit in trying to remember who was who. This was compounded by the way time had passed–both since I’d read the first book and in the story itself. I found a quick review of Crossroads of Canopy was necessary in order to orient me. However, other reviewers have approached Echoes as a standalone book and had no trouble with it. Speaking of cast size, Echoes of Understorey has an even bigger cast. As well as a large number of new characters, many of the significant characters from Crossroads make cameos. Indeed, I was quite delighted that we got to see Unar settled into her new life. The story also continues to build on the world. We get to learn a bit more about the communities in Understorey and are introduced to the warrior school Loftfol. Each level of Titan’s Forest has an interesting and unique naming system, and in Imeris’ brief trip to Floor we get to learn theirs. One minor quibble I had was that we didn’t get to spend more time on that level (although I imagine there will be plenty in the next book). One of my criticisms of Crossroads was that it was a bit slow-paced with few action sequences. Echoes remedies that; being a warrior, Imeris is often required to battle with her enemies. One of the things I liked most about her was the way she does that with cunning equally as much as with physical prowess. The writing style remains a bit dense, particularly at first. I also wasn’t sold on some of the emotional connections between and motivations of the characters. Imeris’s relationship with Anahah in particular felt a bit brief and tenuous for what follows. However, overall I found Echoes of Understorey an excellent instalment in what continues to prove an innovative fantasy series.